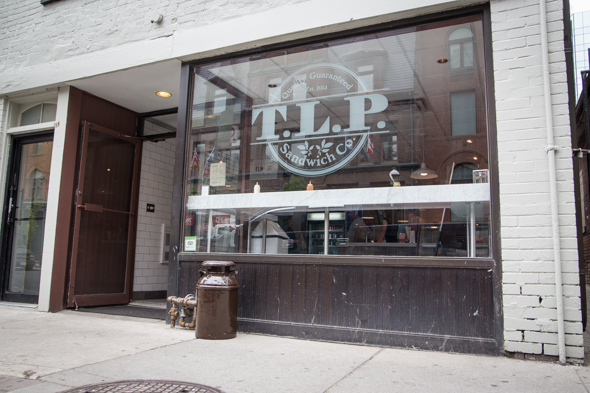 TLP is a sandwich shop masterminded by the same team as Barberian's . 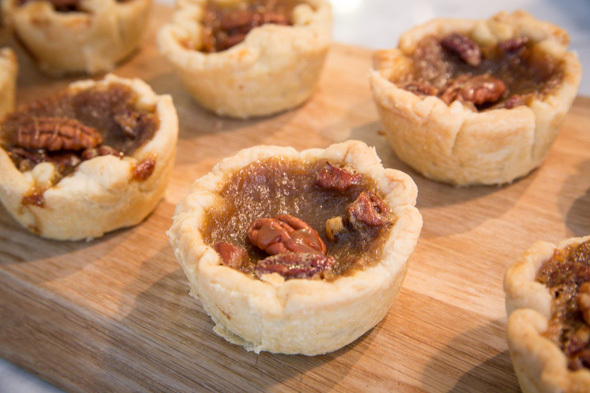 Arron Barberian, Pat Orgera and Jon Andrews took over the long-vacant space a few doors down from the legendary steakhouse to offer an affordable lunch spot that is devoted to nostalgic Canadian comfort foods. 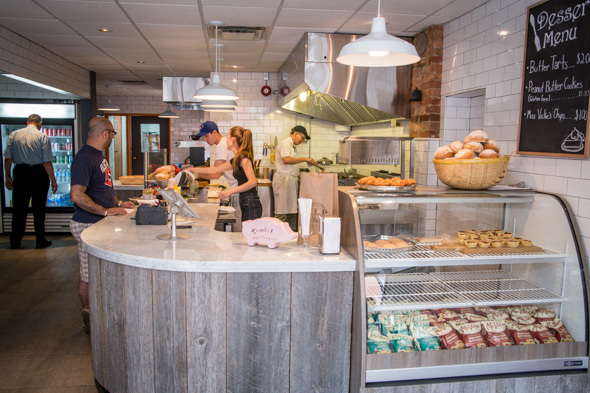 White subway tiles pay homage to the fact the address was once slated to become a premium butcher shop but has since been re-purposed as a short order kitchen. Buttertarts and bags of Mrs Vickie's chips are stocked in a display case, while a marble bar rail offers the only eating space. Prices have yet to be set, but at the heart of the concept is the idea that $10 should get you a sandwich and a drink. When I visit, the first four sandwiches have debuted at $5 (with a can of pop). "We've got classic Coke, but would've done RC Cola if we could," says Orgera. It's the kind of place that revels in nostalgic, lowbrow favourites. Trendy ingredients like pork belly will not make an appearance any time soon...or ever. The opening menu is being rolled out slowly, but will feature five regular sandwiches and a cast of rotating specials. A vegetarian option and home-style meatloaf have been promised for the near future. 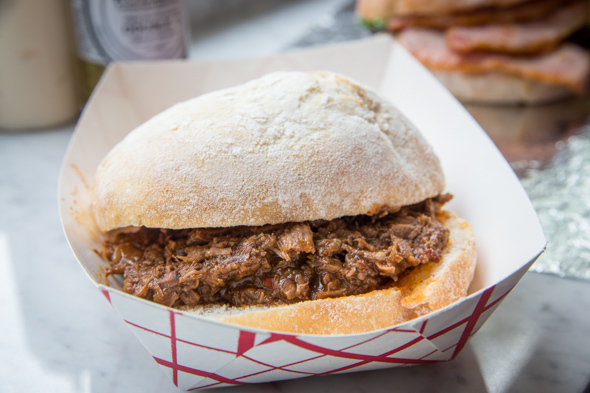 For now, there are choices like the Charlie Blake, loaded with a saucy mess of tender braised beef on a puffy Portuguese bun that was selected for being especially take-out worthy (it's sturdy enough to endure a trip back to the office). The sandwich is served au natural, the meat's own rich brown gravy supplying all the sauce it needs. Extra condiments are available, but discouraged. 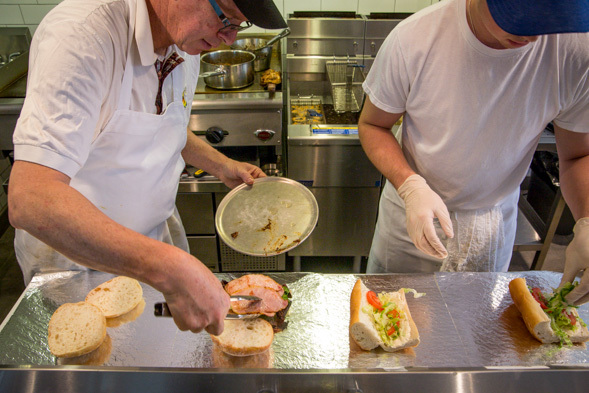 The signature sandwich, the TLP, sees thin, pink peameal layered up with tomato slices and lettuce. "We found a really good supplier," says Orgera. "It's not loaded with water, it doesn't shrivel on the flat top." This sandwich comes naked too - mayo, Tabasco and Kozlik's mustard are available at the counter for DIY application. 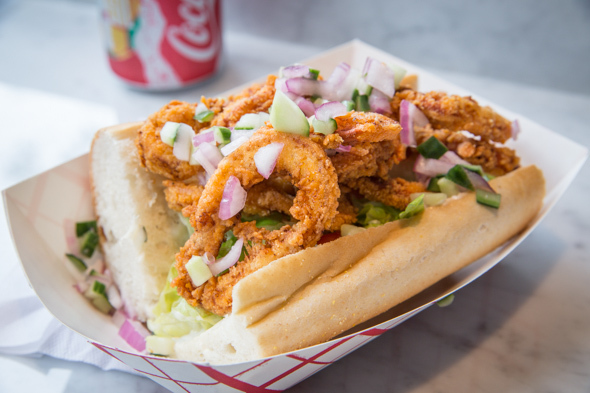 Also on a bun: crispy calamari battered with hot sauce and cornmeal before taking a bath in the fryer. Golden rings are piled high and, in this case, dressed up with lemony mayo slathered onto the bun and sprinkled with chopped onions and cucumber. It's a good sandwich, perhaps even my fave, though the mayo kind of disappears into the bun. I wouldn't mind if they had drizzled extra over top. 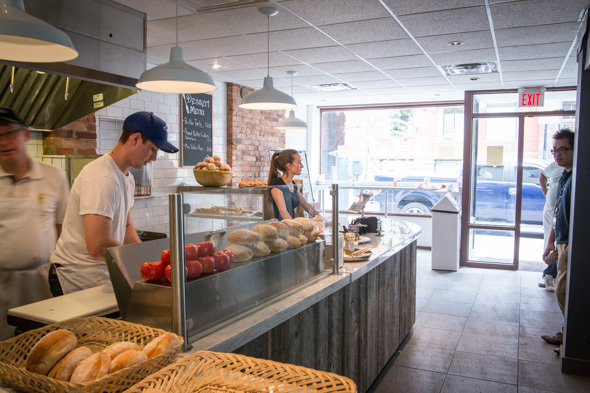 TLP is open daily from 9am - they'll even throw an egg onto your peameal for breakfast. The place aims to capture the weekday lunch crowd, so don't expect it to be open super late - maybe 'til 6pm or so. After all, these guys do have a serious steakhouse to run.